... Within the constraints of the stereo triangle, instrument lateral positioning is encoded: by the fact that we use two microphones, two loudspeakers, and two ears, both our ears' lateral positioning mechanisms, loudness difference and phase (or time) difference, are exercised. Instrument depth is conveyed in quite a different way. Indeed, while it is still unclear how depth is reproduced in stereo, we know for sure that tonal accuracy is a parameter here. A harsh and distorting system surely sounds upfront and in-your-face, while a laid-back, dull system sounds remote and far-away. Therefore, speakers lacking utter timbral neutrality can not convey depth. And if they seem to do, then that depth is purely an artefact of the record/replay system. Other aspects also play a role in conveying the second dimension, room reflections being one of them, but quite how it all is interrelated still escapes us. Suffice to say that all too often in a hifi system, image depth is more a matter of luck than of consistent qualities of both encoding and decoding chains, software and hardware. How about the third dimension? Well, image height is totally lost, as there simply is no mechanism in stereo to transfer it. Some discs do exhibit marked height-effects, but then these sounds are purely synthesized and based on psycho acoustics. In other words, these sounds are not the result of a "pure" record/replay process. 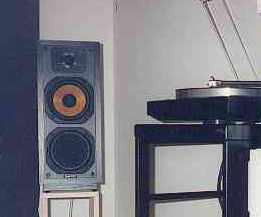 Now summarizing, to approach an ideal reproduction using the stereo system, one needs neutral loudspeakers which are positioned in a room that does not add any sonic signature of its own. No such living room exist, and all of them add standing wave colourations, early reflections, and a reverberant tail of their own. Standing waves colour the bass significantly. Early reflections can be likened to 'parasitic loudspeakers' sitting in the walls. If they arrive at the listener within a few tens of milliseconds from the direct sound, then they damage the timbral perception of recorded sounds, and they also harm the localisation of instruments in our already narrow and precious stereo image. Moreover, loudspeakers themselves are a few orders of magnitude less accurate than microphones (i.e. they colour), while their off-axis responses also differ widely from those of the recording transducers. neutral speakers for timbral accuracy and depth. identical speakers: a level difference of a fraction of a dB already warps stereo. a perfectly symmetrical positioning of speakers and listener: an inter-channel delay of 0.2 milliseconds shifts its source by 10 degrees in the 60-degrees-wide stereo image. 0.2ms amount to a distance of only 7 centimeters, which gives you a fair idea of the accuracy required when positioning speakers! no early reflections (this affects room design, speaker design, and speaker/listener positioning). no standing waves (this affects room design and speaker positioning). an evenly reverberant room, at 0.4s for the midband. We can say, based on experience, that conventional stereo systems (call them high-end if you like) only get to a 50-60% approximation of what is possible with stereo. Die-hard audiophiles then occupy themselves with component choice, cables and other delusive tweaks to obtain gains that are, on the full scale, only a few % at best. Room treatment and optimal loudspeaker and listener positioning can give perhaps 10-20% towards the ideal. But 100% will never be achieved with our current means. However, digital signal processing can help here. So-called time domain digital acoustics correctors, a rare and expensive breed of animal, can flatten the direct sound from a pair of speakers to within 1dB at the listening position. It also can remove room effects in the critical time window of 50ms after the onset of the direct sound. Such a machine can implement our whishing list from above, without touching the rest of the system or the room! With the arrival of cheap, yet powerful, digital signal processors (DSPs) things have become possible which were utterly infeasible before. For, while complex signal processing in the analogue domain is very cumbersome and also does a lot of harm to the precious audio signal, digital signal processing does not kill quality - once you're in the digital domain - and is rather simple, or at least is categorized under exact sciences/applied mathematics/signal theory. Brute force computing enables one to feed the speakers with a pre-compensated signal rather than with the raw music signal from the source. This pre-compensation, in combination with the speakers' and room's deficiencies, then assures that the final signal reaching the listener is entirely devoid of errors, as if a perfect loudspeaker is used, in an inexistent room. Such a method was conceived during the late seventies, at the Acoustic Research company in the USA. Meanwhile others have jumped on it too, so far with only experimental systems (B&W room correction, JM-Lab and Celestion with digital pre-correction for their speakers) or with systems with limited commercial availability (NAD/TACT and Meridian room equalizers, Philips, Meridian and Revox digital-active speakers). Yet, these devices never made much of an impact in the high-end scene... About the only manufacturer who makes these machines and knows how to sell them - to the professional segment of the market - is SigTech (aka Cambridge Signal Technologies). With reason: SigTech is in fact an offspring of AR, having continued the basic research into digital room and speaker correction, and more importantly, having filed enough patents in the area to make it their competitors real hard. The AEC-1000 Acoustic Environment Correction system is a digital equalizer, targeted at the professional studio and auditorium markets (a domesticized version exists, though). The device is to be put between a digital source on the one hand, usually a CD-transport, and a DAC on the other hand. For this task it comprises digital I/O in the coax S/PDIF, Toslink and AES/EBU formats. Should you want to interface in the analogue domain, e.g. using it in an amplifier's tape or processor loop, internal 18 bits ADCs and DACs do the job for you. 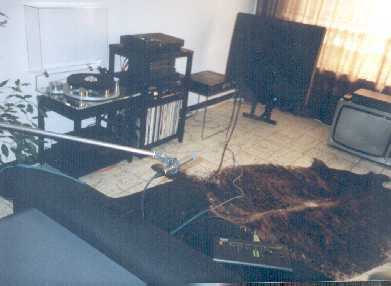 A room, Quad speakers, SigTech computer, and Schoeps microphone. The turntable remained unemployed in this digital-only experiment! Well then, what does it comprise of, this calibration procedure? During setup the SigTech functions as a signal source, emitting pulses alternatively to the left and right speakers. These pulses are again measured by the Sigtech via a microphone at the listening position, i.e. after they have been through the whole system and after they have undergone degradations courtesy of the electronics, the speakers, and finally the room. Provided you take a good one, the microphone is not a limiting factor. In our case it was an omnidirectional Schoeps which probably cost just as much as my whole system. Now back to the pulse sounds. An infinitely fast impulse may seem to be a very simple signal, but in fact it is utterly complex, theoretically carrying overtones (harmonics) up to infinity. As such, impulses are very good at exercising transducer systems, and at characterising them by virtue of the systems' impulse response, or the waveform resulting from sending a known impulse through the signal path. The picture below may clarify a few things. It is the impulse response of an ordinary two-way cone/dome speaker box, mounted on a stand at about 1 meter height, and positioned well off the walls. The response was taken at a normal listening position, 2.5 meters from the speaker. The first impulse at 1 ms is the direct sound from the speaker, being in fact the signal from the audio system's electronics, but already distorted by the loudspeaker; the impulse at 2.7 ms is the first reflection off the side wall, and as you see it is even more distorted. Moreover, it is in amplitude still 30% of the original signal's loudness (only 10dB down), and as such it has to be clearly audible. Can you imagine what the influence of such a distorting parasitic loudspeaker on the sound quality may be? Direct sound and early reflections caused by a 2-way box speaker positioned in an ordinary living room. That's it. Or is it? The above scheme hides one snag. It compensates for the sound system's faults at one specific listening procedure. In order to do this it lets the speakers produce simultaneously music and correction signals. Now, what would these corrections signals sound like when listening from an other position? Got it? Being a bit lazy I was really not willing to totally rebuild my system around the AEC-1000. Instead I opted for the easy way: the Rega Planet served as a transport, piping data through an ordinary cheap analogue interconnect into the SigTech processor. From there I took the digital output over a teflon- dielectric solid-core 75 Ohms video cable and then into a Sony DTC-690 DAT machine, which - set to recording mode - served nicely as a DAC. The rest of the system was standard: Quad 34, 306, and ESL speakers on their stands. Alternatively I tried an older pair of cheap box speakers, the BNS Quintets. And so we start analysing my faithful born-in-1976 Quad electrostatics. Now, knowing that these are dipole speakers - in the bass and midrange, that is - positioned about 80 centimeters in front of a wall and window, we can easily predict how they would behave sonically. The out-of-phase backwave from the speakers bounces off the back wall and combines with the direct sound after passing through the speaker's diaphragm. For a half-wavelength of 2x80=160 cm, corresponding to 106Hz, this combination is additive, causing a pronounced peak at that frequency. For a full-wavelength of that 160 cm, or 212 Hz, the interference is negative, resulting in a sharp dip there. Well, that's what my pocket calculator says. How about the SigTech's opinion, based on measurements? In-room frequency response of the Quad ESL speaker. Ha, isn't science wonderful? It predicts there is a problem, and then it shows you unmistakably there is a problem! Sadly, I have to stick to this speaker setup for as long as we're in a small living room, and so I have to endure the resulting sonic signature: thick and lumpy bass, and a thin, bodyless lower midrange, all courtesy of the room, not of the speaker!! But see, even if I were a total nitwit in acoustics, the SigTech would have told me now where things go wrong. And this would enable one to act accordingly, modifying the speaker setup or the room layout. And so a SigTech processor can contribute to a dramatically improved sound, even when it is not in use! Reviewers often use words like 'neutrality', 'detail', 'imaging', 'microdynamics', etc. I dare say now that, if they never experienced a system like this, they don't even know the true meaning of these words. Switching on the AEC-1000 was like lifting the proverbial veil. But for real, this time. Not as part of a writer's hyperbole. As if, with the flick of a switch, you go from a crappy picture taken with a cheap digital camera to a colour print on large paper, taken with a mid-format Hasselblad: The SigTech pretty much killed-off my system as I knew it, raising an aural phoenix from its ashes, one that sounded not unlike gigantic Stax headphones. But better still. Imagine a laaaarge soundscape, from the left wall to the right wall, sounding utterly consistent from the bass limits of the speakers (70Hz with the ESLs) right up to the edges of audibility. The speakers acting as a whole, without any feeling of the artificial dissection even the best normal designs still feature between their various drivers. And moreover, both speakers sounding completely identical, so that the stereo image not only is extremely wide, but also has enormous spatial resolution and detail. Instruments and voices sounded totally at ease, each in its own position, not crammed on top of each other and not with one shouting over the other. These sounds just co-existed, without mutual influence, completely detached from the music reproducing system, and seemingly even from the music reproduction process itself. Yes, that's where I am leading at: the SigTech made the music sound so much more like real music - with all of its intricacies often lost in ordinary systems - and so much less than a bunch of components trying to sound like the real thing. Which is exactly what I did. For many hours, and often deep into the night. And that because music, when experienced this way, is very addictive. Oh, and lest you would think this computer-based business is overtly clinical or revealing - in the wrong ways - then be assured that pretty much all of the CDs I threw at it ended up sounding good, even terminally compressed and dulled ones like Heather Nova's. This makes you think about the established hifi rules, not? SigTech-corrected in-room frequency response of the Quad ESL speaker. Was it all perfection then? Of course not. I have a few gripes with the sound I heard. Minor gripes, as they can be compensated for. The overall sound balance was a bit bright. But then, the SigTech as installed equalized for a ruler flat response, which is often not desirable in a living space. Instead, it can be programmed for a slight downtilt above 4kHz or so. My version of the software did not support this, or perhaps I was just to dense to provoke this functionality from the system, so I had to manage with just the one reference response. Another thing was an apparent lack of depth in the sound stage. But as you already read earlier, most stereo recordings don't even contain real and correct depth information, which is kind of consistent with my findings. Further, I was playing through the Sony digital-to-analogue convertor, and that one really is not a reference when it comes to musicality and other audiophilistic parameters. How the position-dependency? Aha! That's the curious part. SigTech have done a great job with this one, as while the sound when listening close-up to the speakers (between 1 and 1.5 meters) was positively funny, lumpy, and phasey, the sound field when listening in the large zone behind my listening chair was still pretty good. And by all accounts better than the uncorrected sound. My old BNS speakers cost about ECU450 way back in 1989. They are mid-sized stand mounters employing a soft-dome Audax HD25 tweeter, and a bright-yellow Kevlar® Audax/Siare woofer. There's also a passive radiator, aligning the box to something like a damped ported design. Their sound au naturel? Well, these must have been one of my biggest hifi mistakes ever (together with the Linn Axis turntable). Dry, verging on the harsh, without any real bass to speak of, and in my large listening room also without much stereo to speak of: there's left, then a hole, CENTER, again a hole, and right. Imagine the sound of giant telephone horns. That's about it. In-room frequency response of the BNS Quintet speaker. That's it until you drive them from a box full of silicon thingies. Believe it or not - you'd better do, though - but after engaging the SigTech there was stereo width, wall-to-wall. And there was a proper bass. And warmth. And neutrality throughout. In fact, the DSP-driven BNSs managed to sound significantly better than the Quad ESLs used without DSP, bar a residual dryness. And yes, they were almost as addictive as the ESLs with SigTech. If anyting, they even beat the latter in bass slam and overall loudness. This just to prove that if you throw sufficient computer power at a crappy system, it shall sing, in the end!!! SigTech-corrected in-room frequency response of the BNS Quintet speaker. I've heard the future, and it looks entirely unlike the past. © Copyright 1998 Werner Ogiers for TNT-Audio (www.tnt-audio.com). This is Robert Greene here (REG of The Absolute Sound). I just wanted to tell you how much I enjoyed your review of the Sigtech. As one of the US reviewers that you mention that has given it (very) positive appraisal, I have often felt a little as if I were alone with this view, something like the man on the Hyde Park soap box in the old Punch cartoon who is being listened to by no one while all the people are listening to the next guy over, and the lonely speaker is saying "Yet how is it that these vital facts are virtually unknown in this country today???". After reading your review, I feel less like this!! Nice work, indeed.